I am delighted to announce the release of the Screaming Frog Log File Analyser 2.0, codenamed ‘Snoop’. Since launch last year, we’ve released eight smaller updates to the Log File Analyser, but this is a much larger and more significant update, with some very exciting new and unique features. 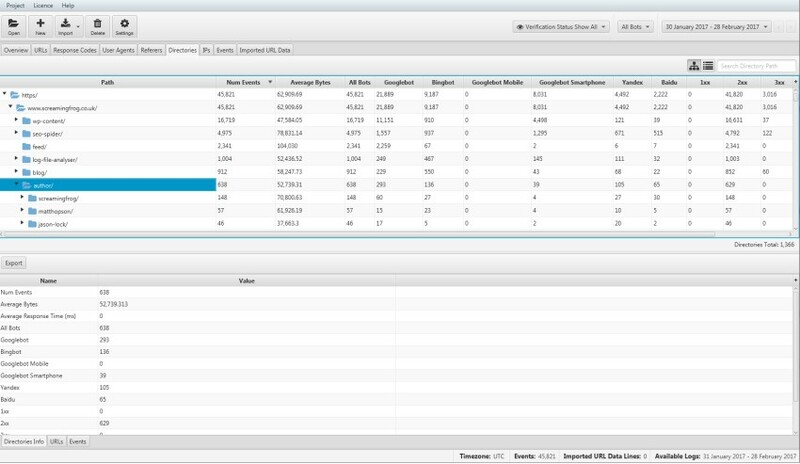 Let’s take a look at what’s new in version 2.0 of the Log File Analyser. You can now automatically verify search engine bots, either when uploading a log file or retrospectively after you have uploaded log files to a project. Search engine bots are often spoofed by other bots or crawlers, including our own SEO Spider software when emulating requests from specific search engine user-agents. Hence, when analysing logs, it’s important to know which events are genuine, and those that can be discounted. The Log File Analyser will verify all major search engine bots according to their individual guidelines. For example, for Googlebot verification, the Log File Analyser will perform a reverse DNS lookup, verify the matching domain name and then run a forward DNS using the host command to verify it’s the same original requesting IP. After validation, you can use the verification status filter, to view log events that are verified, spoofed or if there are any errors in verification. There’s a new ‘directories’ tab, which aggregates log event data by path. If a site has an intuitive URL structure, it’s really easy to see exactly where the search engines are spending most of their time crawling, whether it’s /services/ pages, or the /blog/ etc. This view also aggregates errors and response codes ‘buckets’. This aggregated view makes it very easy to identify sections of crawl waste or those that might need attention due to lack of crawl activity. The ‘directories’ tab can be viewed in a traditional ‘list’ format as well as the directory tree view. The directory tree view seen in the new ‘directories’ tab is now also available within other tabs, such as ‘URLs’ and ‘Response Codes’, too. There’s a similar feature in our SEO Spider software, and it can often make visualising a site’s structure easier than traditional list view. You can now view aggregated log event data around each of these attributes, including number of events, unique URLs requested, bytes, response times, errors and more. 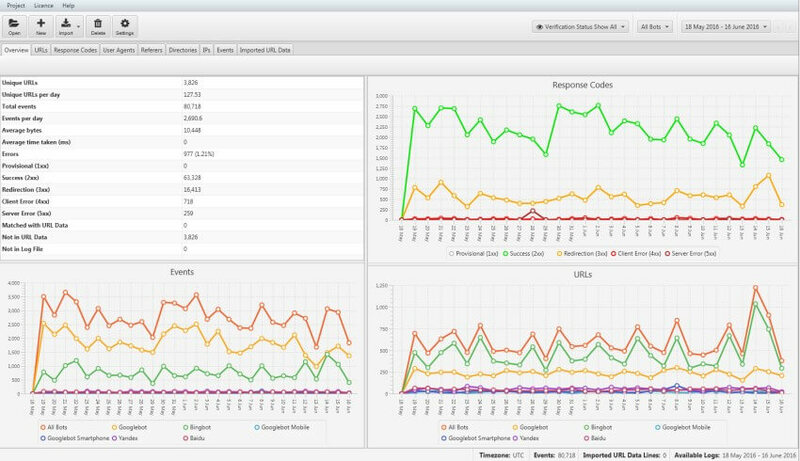 Analysing log event data aggregated around specific user-agents allows you to gain insights into crawl frequency, spread and errors encountered. In an ‘all log event’ project, you can view every user-agent in a log file, including browsers, various other bots across the web, alongside search engine bots. Or perhaps you want to see specific IPs that have been spoofing search engines to crawl your site (before blocking them!). We’ve had a lot of requests for this feature. The Log File Analyser now supports the specific AWS Elastic Load Balancing log file format. This means you can simply drag and drop the raw access logs from Amazon Elastic Load Balancing servers straight into the Log File Analyser, and it will do the rest. An ‘All Googlebots’ filter to make it easier to view all Googlebot crawlers at once. Users do not need to install Java for the application independently anymore. We hope you like the update! Please do let us know if you experience any problems, or discover any bugs at all. Thanks to the SEO community as usual, for all the feedback and suggestions for improving the Log File Analyser – there’s plenty more to come. Now go and download version 2.0 of the Log File Analyser! Add support for custom W3C field for deriving protocol from Server Variable HTTPS. Speed up duplicate event checking. Don’t display Average Response time with decimal places. Fix crash when importing invalid W3C log file. Fix crash when importing an empty zip file. Fix bot verification during import to use correct IP. Don’t fail entire import when a zip file won’t uncompress. Fix Event tab in lower window of User Agent master tab to filter on selected UA. Fix crash when exporting from the Directories tab. Fix over over numbers not updating after URL Data import. Fix broken search in details tabs. I love updates! This means improvements! You are doing a great job there! The filters for 2.0 are needed! The updates are awesome! lot’s of improvement. Hello! Thank you for rolling out this new improved version. The updates are very much appreciated, as they go towards what user needs, especially IP monitoring; thanks for listening to users feedback! However, please allow me to point a potential deal breaker for professional users: import speed. I have measured import speed by importing a large log with 4 million entries. Log Analyser took about 10 minutes to import the log, with an average speed of 6k entries per second. GoAccess, on the other hand, took about 2 minutes, with an average speed of 35k lines per second. If I enable the “Search Engine Bot Verification” feature, instead, the speed drops down do the order a hundred entries per seconds, which renders it unusable (screenshot: http://d.pr/i/khkk). It is not my intention to disparage your great work: I love the new features and the program’s interface. Actually, in my web agency I am a vocal supporter for Log Analyzer. Alas, it turns out that my colleagues keep using GoAccess instead, the reason being that time is the most valuable asset; ten minutes vs two minutes is a big difference. We’ll take a look at GoAccess, as they might be crunching their data differently. We allow users to access every single event etc, we don’t chuck anything away. It’s also worth noting – The estimated time for Bot Verification always starts off really high, but reduces considerably as we get more cache hits. You’ll see anyway! We’ve also filled an enhancement for version 3.0 to look into our import performance, to see if we can do better. Updates are awesome. Thanks for the updates .